New York drivers are sure to be impressed with the genuine Toyota parts inventory at our Toyota dealership near Rochester, NY. Our well-stocked auto parts selection includes everything from oil filters and brake pads to transmission components and spark plugs. See why there is no substitute for OEM Toyota parts by visiting LeBrun Toyota. If you know which authentic Toyota parts your vehicle is in need of, you can order Toyota parts online. Or, head to our Greater Rochester Toyota dealer to meet with one of our certified Toyota technicians. They’ll give you all the information and advice you need for DIY repairs, and can even set you up with a Toyota service appointment should you want us to install the parts for you. Ditch inferior aftermarket auto parts for specifically engineered OEM Toyota parts and accessories. 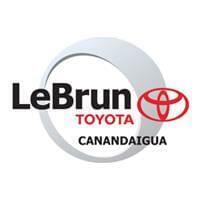 Shop for Toyota parts at LeBrun Toyota!